Slag and scrap steel processing plants will be high-flyers of energy efficiency market in the future. Slag is the inevitable outcome of blast furnace iron making and steel making, and there is around 12~14 percent of slag when making 1 tons of steel. At present, the utilization rate of steel slag is only 10 percent in our country, and the cyclic utilization rate of steel is only 19.9 percent, which is considerably lower than the average level in the world. Iron and steel scrap is the only material substituting for iron ore, and abandoned slag and scrap steel is kind of waste resource. In conclusion, slag and scrap steel processing plants present huge development potential and broad market prospect. 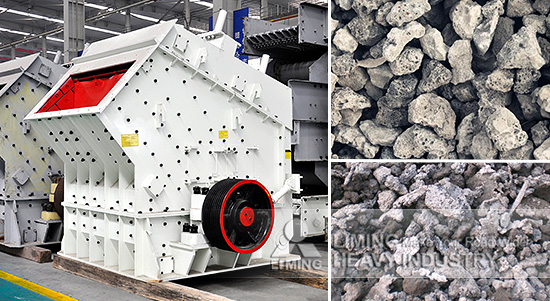 Impact crusher made by Liming Heavy Industry adopts the world-class manufacturing processes and the most high-end raw materials. Besides, we can guarantee the high quality of rotor by the design of heavy type rotor and the strict test. The unique fixing device for the hammer makes it more reliable and self-equipped open-top device makes the replacement of wearing parts more easy. There are rich cases about impact crusher applied in many countries and districts, if you are interested in this equipment, just contact us to get more details or visit the crushing line with our conduct.